Time sure flies by, as we find ourselves at the beginning of the most festive and busiest months of the year. And while the season is meant to be enjoyed and shared with those closest to you, it’s also easy to end up focusing on all the shopping and errands you just need to get done instead. Don’t let the holiday rush overtake you. An early start will help you cruise through your gift list – and with Mastercard and The SM Store – offer you a more rewarding shopping experience. Cardholders have dedicated Mastercard lanes in all SM Store branches (all 62 of them!) for faster queuing and transactions. Enjoy leisurely going around the one-stop destination to tick off everything you need for Christmas without worrying too much about long checkout lines. Mastercard is also giving you even more reason to start gift hunting early. 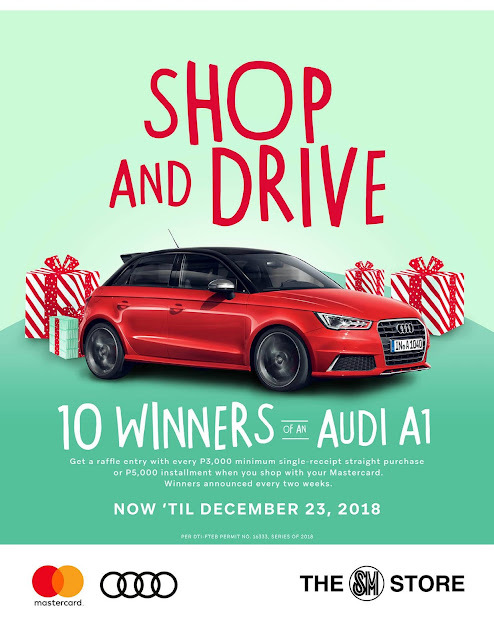 With the Shop and Drive promo, cardholders have the chance to win an Audi A1 simply by shopping at The SM Store. A total of 10 lucky winners will be picked from purchases made from October 8 to December 23, 2018. With every P3,000 minimum single-receipt purchase or P5,000 installment, cardholders get an automatic raffle entry to win a brand-new set of wheels. If customers present their SM Advantage Card or Prestige Card along with the purchase, they get double the raffle entries, increasing their chances of receiving a gift they won’t forget. Per DTI-FTB Permit Number 16333 Series of 2018.